A native Northwesterner, I was raised in Portland, Oregon, spent a decade on the Oregon coast and have enjoyed island life in Staten Island,New York and the Florida Keys before finding my home on Orcas in 1989. I studied commercial art in my youth but never discovered my muse until moving here. I find Orcas Island to be a constant source of inspiration for my many projects, and try to let the world that surrounds me be reflected in my work. My intent is to delight myself and others with what I do. Color, scent and texture are my mediums. My work reflects my passion for color and light. My jewelry is made with either sterling silver or 14 k gold fill components. 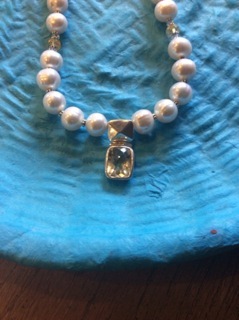 I am drawn to using mainly semi-precious gemstones and fresh water pearls, often with Swarovski crystals highlights. The tradition of rose beads goes back thousands of years. They were used to make the original rosaries. They have also been linked to the Essenes in northern Africa and found in Egyptian pyramids. One particular pioneer American tradition is to be married in rose beads. Like a good relationship, when properly tended the beads become more beautiful and strong over time. They make a lovely gift to pass on through generations.I make these rose beads from heirloom Orcas Island roses…and nothing more.Each bead is made with between 8 & 20 roses. It takes 3 to 4 months to make a year’s batch of beads. The more the beads are worn, the more polished or cured they become, taking on a beautiful glow with age. In my “spare” time during the winter months, I enjoy making baskets and rattles. The rattles are woven using the same technique as in my sea grass and yarn baskets. I attach the “shakers” to pieces of driftwood that I gather from island beaches and adorn the finished rattles with beads, bells and/or feathers. I also try to make one or two coiled baskets each winter, using Ponderosa pine needles I gather east of the Cascades on my yearly foraging trip.